Photograph shows Canadian National Railway Station situated on Main Street. Canadian Pacific Railway. Postcard shows William Whyte Park and Countess of Dufferin in foreground, looking Northeast to C.P.R. Station and Dominion Immigration Hall. Date of postcard is approximate, ca. 1920. Photograph shows Canadian Pacific Railway Station on Higgins Avenue. Date of photograph is approximate, ca. 1940. Postcard shows newly constructed Canadian Pacific Railway Depot located on Higgins Avenue. Date of postcard is unknown, [before 1949]. 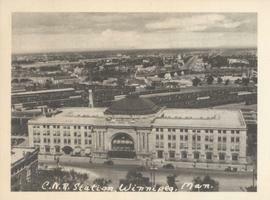 Photograph shows Royal Alexandra Hotel and Canadian Pacific Railway Station. Date of photograph is approximate, ca. 1940.